Be aware that the credentials of someone calling themselves an arborist can vary widely. Don’t just hire someone with a chain saw who knocks on your door! Accreditation is the only business practices and compliance program for tree care companies in America. Companies accredited by TCIA are required to provide documented proof in many areas that protect consumers. 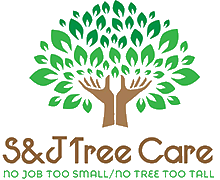 When you hire an accredited tree care company, you can rest assured that TCIA has checked for proper insurance, applicable business and pesticide licenses, and customer service that is reliable and ethical. Make an informed decision – choose a company with the TCIA Accreditation “seal of approval.” Find an Accredited TCIA member company by company name, zip code, services or other criteria. When meeting with your arborist for the first time, ask to see current certificates of liability and workers’ compensation insurance, if applicable. Don’t be rushed by a bargain, don’t pay in advance, get estimates in writing and insist on a written work order. Get additional estimates or opinion of the needed work. When the call goes out to tree service companies to work on widespread storm damage, anybody with a chain saw and a pickup can respond, but it’s the companies that are prepared and have experience in this field that excel and come out making money. 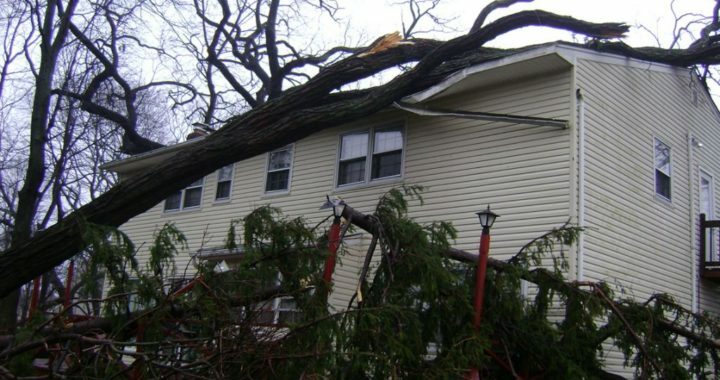 In general, there are three segments of storm response: preparation and planning, executing the tree work, and the cleanup and follow-up phase. The following companies have done this kind of arduous work after many storms in different areas of the country, and each has its own methodology for dealing with the fallout. “You’ve got to drop everything you’re doing. It’s very challenging from that standpoint,” says Ryan Lombardo, owner of Lombardo Management General Contractors of Atlanta, Georgia. He should know, his grandfather “traveled the storms” for years, and now Lombardo has set up a unique way of dealing with everyday tree services, as well as storm catastrophes. A storm demands services bigger in scale than a company would normally be able to cope with, Lombardo says. A company must be prepared to ramp up its activities to the level demanded by its clients. LMGC is an unusual company, in that it has about 50 talented supervisors, some of them part-time workers, who contract on-the-ground work through a wide network of other companies in its service area and beyond. In preparation for storm emergencies, LMGC maintains equipment that will be used only in the event of major storms. The company has responded to Louisiana hurricanes and ice storms in Massachusetts. It purchased 30-foot construction trailers outfitted with the communications and tree removal equipment needed on a large scale. “We were in on the Katrina cleanup, and we could hardly make a phone call out,” says Lombardo, who explains that chaos and confusion ensue in a community hit by a major disaster. Thus, the company’s emergency trailers are equipped with satellite communications, Motorola radios that will reach out 15 miles and fuel supplies for up to two weeks of operation. The trailers also store food, water and bunks for sleeping, as none of these basic human requirements may be available in a disaster area. The trailers, which cost up to $100,000 stocked, also have the computers and office equipment needed to service the paperwork and plans needed to deal with the Federal Emergency Management Agency and county and municipal clients. LMGC relies on other contracted companies to provide crews and heavy equipment, but it has to be able to manage and coordinate them. Planning and execution of the cleanup will be different for every community, and the company has collected plans for cities from Texas to North Carolina in order to be prepared. It also keeps records of the different emergency management plans and contacts for the agencies involved. Lombardo’s company must abide by those, as well as insurance company rules. This is when that network of companies with trained personnel comes into play. Having experienced supervisors who know the procedures, as well as the labor and equipment required, is a big part of such jobs, because from the initial scouting on it will be extremely difficult to work under the tight emergency constraints. Training is another major element in preparedness. LMGC may have training sessions every day during the periods before disaster seasons. This may consist of the nuts and bolts of emergency management or how to keep a backpack with a change of clothes and other personal needs, because when a disaster strikes, the company may need to go into action immediately. David McMaster is a storm master. He’s the vice president and division manager for The Bartlett Tree Experts in Southampton, N.Y., overseeing operations for five offices in the Long Island, Queens and Brooklyn areas, as well as several counties in Connecticut. Over his 29 years with Bartlett, he has experienced hurricanes, ice storms and tornadoes. The 120 production employees he oversees are not storm chasers, but they must respond to clients’ needs. Bartlett is a large national company, but McMaster notes that the safety and training coordinators in his division are trained to mobilize immediately and largely take responsibility for logistics and operations. A list of their clients is kept in their vehicles so they can be contacted and notified of damage, as well as to set up communication lines. “The most fundamental thing that needs to be done, I think, is an overall assessment,” McMaster says. The company prioritizes storm damage work in three phases. The first is to perform a kind of tree triage in order to ensure the safety of persons and property. For example, removing a tree from a house that has had its roof punctured would be a top priority. This is a crucial and dangerous phase of the work, wherein the company will “hopscotch around” its client base in order to perform those important tasks, which often includes power line clearance. Heavy reliance is placed on experienced crews that have the particular skill sets needed for this type of work. In fact, the company identifies such crews within each office and prepares them to be the first responders. “Every office has an assigned crew in a position to react to storms,” he says, and McMaster will know specifically what competencies and equipment they will have on hand. Part of the job is to muster enough large equipment such as cranes and log loader trucks. Crews must be trained in safety under these adverse conditions, as well as in special work such as advanced rigging techniques. Additional company crews from as far away as Texas and Illinois may be called in to assist, as Bartlett’s clients include municipalities that expect prompt response. The second phase is the removal of the damaged trees and wood. This requires the use of even heavier equipment and trucks with lift gates to reduce the strain on workers. The company does not take chippers and stump grinders to clients’ properties in the first phase, because they will be in the way, and the workers will be inundated with requests to take away the wood immediately. During both of these phases, safety is the primary concern of the crews. Every office has an inventory of extra equipment, such as hard hats and large chain saws, and Bobcats and front-end loaders make the work lighter. All workers wear ISA-sanctioned safety gear. Phase 2 crews don’t need all of the aerial skills of the phase 1 crews, but more workers will be needed because of the volume of materials handled. “A big part of this job is to ensure that our crews have the right amount of food and fluids,” McMaster says. That is the job of coordinating supervisors, and that also includes keeping lists of hotels where workers can stay near the job. Company offices are used as a “bivouac,” where they can sleep, and they have utilized camps such as those used for 4-H students to keep workers near the job. Greg Gray has been in business for 25 years and has seen many punishing storms in the Pacific Northwest. His company, A Better Cut Greg’s Tree Service in Vancouver, Wash., is small, with only three employees, including himself. However, when widespread storms or tornadoes hit, he is set up to respond immediately. His crew and any emergency hires will be trained and conscious of the difficulties presented under these conditions. “It’s a lot more adverse conditions when you’re trying to cut a 150-foot fir tree out of somebody’s living room,” Gray says, and the storm may still be raging while crews work. One thing he does is set up a priority system for cleanup, because it is more important to take a downed tree off a house than it is to remove it from a car, for example. “You have to schedule stuff, because in these storm conditions you are on the move constantly,” he notes. This means the company has to be highly organized with both crews and equipment. It is also important in the cleanup phase to not take on too much, while at the same time having all the needed equipment at your disposal. Communication with the client on his needs and the type of homeowner’s insurance he carries is crucial. The ultimate payment depends on the stipulations of the insurance policy, so these aspects must be talked over and agreed upon before work starts. For example, Gray says, many policies will pay for the removal of the tree, but not the roots or stump, and this should be ascertained early on. The cleanup phase of a disaster is very labor intensive, and it calls for specific types of equipment that differs from normal tree removal jobs. 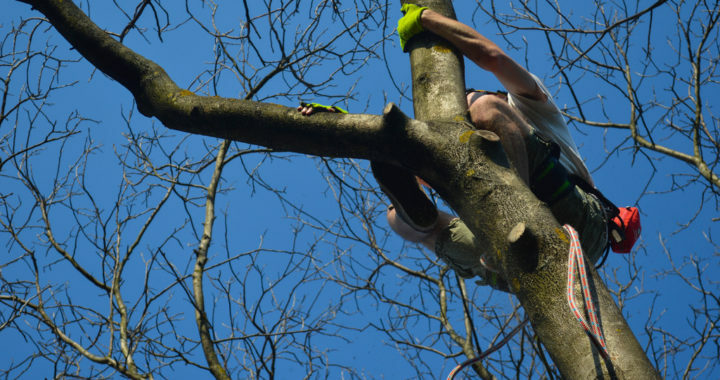 Demand for qualified tree labor is high at the time, and that means the company must maintain a list of potential temporary employees beforehand. Gray says he even networks with his competitors to make sure he can find good help. Gray owns 55-foot Hi-Ranger and 35-foot Versalift boom trucks, as well as large Vermeer and small Rayco stump grinders. He has a dump truck and a Brush Bandit chipper. These generally serve him well during a disaster, because he can clean up only one job at a time anyway. He keeps his crew working together throughout for both speed and safety requirements, so he has to carefully schedule when the crew can return to a site and do chipping and wood removal. It often takes three or more visits. Routes to disposal sites must also be scouted during a disaster, because roads may be closed. He comes prepared to clear trees from roads, but it is more efficient to take cleared routes. Every tree company will be hauling to the same sites at that time, so Gray lines up private people who will take the wood from emergency jobs. Over the past 25 years, he estimates, he has been able to give away 95 percent of the wood and chips he has processed. He tries to give as much as possible to senior citizens who rely on free wood for fuel. He also has nearby farmers who will allow him to unload on their property in emergencies. Since time is a factor on these jobs, and his crew often puts in 15-hour days and may work into the night, safety is a major concern. Instead of rushing jobs during the crisis, Gray’s crew is trained to slow down and make sure safety is paramount. This is where a bonded and insured company can have an advantage over fly-by-night companies that try to take advantage of the emergency situation. Gray is proud of the fact that he has never had to hire a lawyer to represent him because of poor workmanship or mistakes. This comes from the fact that, even during an emergency, attention is paid to doing quality work. Through follow-up calls and visits, he will make sure his clients are satisfied. That leads to work once the disaster is finished. “You get a lot of referrals for a job well done,” Gray says, and that helps him compete with companies that are not licensed and bonded. And, the next time a disaster strikes, he will be the one people call. Tree care crews work in a variety of environments: urban, rural, suburban and sometimes isolated, but all of these work sites will typically have one very important, and dangerous, item in common: electricity. As much as the beauty and wonders of electricity may evoke a sigh of contentment as a refrigerated adult beverage is cracked open and the flat screen responds readily to the buttons on the remote, that same force can stop a beating heart, cause horrific burns or even blow holes right through equipment and flesh. This almost always present, powerful and dangerous force requires that all crew members be well trained and educated on how to identify electrical hazards, avoid them and, if present, know the safest way to work around them. Dr. John Ball’s accident and fatality statistics have shown year after year that electricity plays a major role in injuring, or, more sadly, removing permanently from the workforce, those tree care personnel who either don’t have a knowledge and understanding of electrical hazards, or use a little knowledge or misinformation to make very bad decisions. 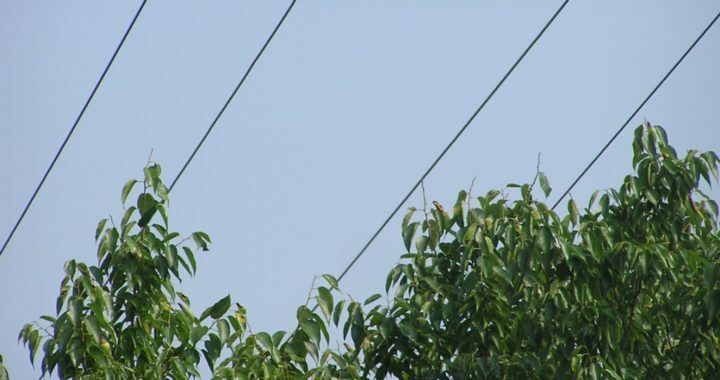 As with most topics discussed in this column, there is no substitute for hands-on field education and training in electrical hazards, and there are a wide variety of organizations that instruct in this vitally important topic, but the basic information discussed here provides a good introduction to what tree professionals should be looking out for as they go about their daily routine of caring for trees. Table 1 illustrates the minimum approach distances for non-line clearance qualified arborists, and as such should be obeyed in all situations. In short, a non-qualified climber or crew member should never be closer than 10 feet from any energized conductor and should be much farther away in the case of greater voltages. As can be seen in the table, higher voltage means more distance. Crew members would do well to remember that while electricity typically will travel through any conductive material in the shortest and most direct path to the ground, it can certainly also arc right through the air to a conductive material, depending on weather conditions, and thus continue its journey to the ground through the climber, tree or aerial lift. Electrical contact may be either direct or indirect, but the end result is typically the same, with the voltage continuing on its merry way to the ground leaving behind damaged, or even dead, material and personnel. As mentioned, non-line clearance qualified personnel should never be nearer than 10 feet from an energized conductor, and with higher voltage should be even farther away. However, there are aspects of PPE that even these personnel need to be aware of for safety reasons. Any hard hat or helmet that is used in the vicinity of electrical hazards must have an E rating and consist of a solid body with no vents or holes that would permit electricity to directly enter the brain housing group. In general, all climbing equipment is conductive to some degree, but in the presence of electrical hazards tree crews should take care not to use gear that is extremely conductive, such as wire-core lanyards, and use less or nonconductive options, such as fiberglass ladders and foam-filled poles. A common misconception is that the material, if present, coating many electrical lines is insulation. This material is weatherproofing at best, providing minimal, if any, insulation and should never be considered to provide any protection against the electricity in the wire. This term describes the contact of any part of the climber or operator’s body with an energized conductor. Direct contact is often a consequence of a climber or aerial lift operator not fully inspecting the work site or all aspects of the tree’s canopy for the existence of overhead energized conductors. In addition, storm situations in which lines have reached the ground, are entangled in brush, or have even settled and snaked into a tree’s canopy after detachment from the poles can lead to direct contact. There is no better preventative measure for direct contact than a full and complete hazard inspection of the tree and work site by all crew members prior to work. After all, if you don’t know it’s there, it’s pretty hard to avoid. Indirect contact is contact with an energized conductor through something other than the pieces and parts of the climber’s or operator’s body. It can happen through trees, branches, ropes, trucks, uninsulated aerial lifts, conductive tools or anything else you care to name that can conduct electricity. Indirect contact can also happen, particularly during storm situations, when an energized conductor has come in contact with a typically “safe” conductor such as a metal fence, cable lines or even the metal stripping lining some street curbs. This type of indirect contact possibility can be particularly hard to identify due to the possible distance away from the downed line that has “electrified” the fence or curb. Once again, the primary preventative measure for avoiding indirect contact is inspecting and recognizing the existence of electrical hazards, but also being mindful of how actions within the work plan — climbing and rigging lines, aerial lift booms, pole pruners, falling branches, etc. — may come into or affect the minimum approach distance, allowing the electricity a path to the crew indirectly. This term describes a situation in which the ground itself has become “juiced.” The area of ground energized will vary with voltage levels, soil type and the amount of moisture present, but is often caused by downed lines in storm scenarios or through the outriggers on an uninsulated or poorly maintained aerial lift that has come in contact with a line. In the case of the energized truck, it is yet another reason for ground personnel to avoid standing around leaning against the truck while the operator works aloft. Particularly dangerous and unique to ground faults is the possibility of step potential. In all likelihood the areas of the ground that are energized are all at differing levels and anxious to “even” themselves out. A crew member walking through such an area, or fleeing a suddenly energized truck, provides the conductor the electricity needs, entering through one foot, moving up through the body and then out through the other foot to a piece of ground with a lower voltage. One option to deal with this step potential is for the crew member to take very small shuffling steps, keeping their feet close together, to get out of the area of ground fault, thereby minimizing the possible voltage differences between one foot and the other. All crew members should have the knowledge and training to react quickly and efficiently in the event of an electrical hazard accident. This should include items such as operating a bucket with an electrically incapacitated operator from the ground, having the number of the responsible utility readily available, methods and techniques for safely breaking line contact from the ground, and how to avoid becoming a “second” victim. Electricity is something that is present, both benevolently and hazardously, in almost every day of tree care work. While the hazardous nature of electricity can never be eliminated, knowledge, training and awareness can go a long way toward helping tree care professionals work safely and efficiently in its presence. Regardless of whether a crew member is line clearance qualified or not, they must always remember that electricity is completely and totally nondiscriminatory: it will take the shortest path to the ground, whether it be tree, tool or flesh, so it’s best to avoid being in its path.